Swans are most suited to larger or more specialist waterfowl collections due to the nature of their temperament and requirement for space. They are a favorite in city parks, zoological gardens and country estates as easily maintained if an expanse of water is available. Swans spend considerable time in the water, but some also graze ashore. They are voracious vegetarians and their diet in captivity should be supplemented with wheat and layers pellets. Breeders pellets are recommended in breeding season. Swans benefit from a long lifespan, some reaching as many as 30 years. Pair bonds are strong and swans usually mate for life. 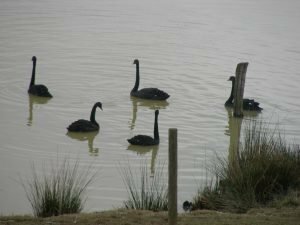 Mute, black and whooper swans are prolific breeders but other species breed more sporadically. Black swans are prominent in wildfowl collections across the world. Easily recognizable by their black plumage, white flights and bright red bill, the black swan has a proportionately longer neck than any other swan. It is a feature that makes it particularly graceful whilst afloat. The black swan has a soft high-pitched bugle that is not very far reaching. It can also whistle, particularly when disturbed from nesting. Nesting tends to occur in wetter periods and can be as an individual pair or nesting in colonies. The swans build large nests in shallow water or on islands, with a typical clutch of 4-8 eggs which take 35-40 days to hatch. Be the first to review “Black Swans” Click here to cancel reply.